There's a text box at the bottom of every page, allowing anyone to add to the page at any time, right from that page. Their contribution is added to the bottom of the page, in a style similar to that of IRC chat conversations. You can still edit the text of any page at any time. However, the (usually extensive) navigation links at the bottom of every wiki page have been pared down considerably, so that Wala pages are less intimidating. 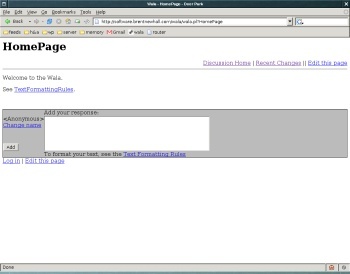 Wala is written in Perl, and may be easily used in conjunction with other Perl scripts. It should run on most Linux or Unix web servers which support CGI. It will probably work with your web host. Good question. A wiki is a website where anyone can change any page at any time. The entire website can be completely rewritten by anyone. This means that any errors can immediately be fixed by anyone who happens to see those errors. Moreover, a wiki uses a very simple markup syntax. Instead of using HTML's sometimes confusing tags (like <p> and </p>), wikis use simple characters like ''this'' for emphasis or '''this''' for bold. Versioned tarballs and other paraphernalia shortly. Download, browse, or view in action. Offers simple backlinks, a fancy index of pages, "correct" XHTML, and a few premature optimizations.